Today is day 2 of our 3 day costume trivia contest. Whoever gets the most correct over 3 days will win a prize ( in the even of a tie, there will be a drawing). All the costumes represent a movie, the year it was released is in parentheses. Contest ends Tuesday at 9PM EST, winner will be announced on Halloween. 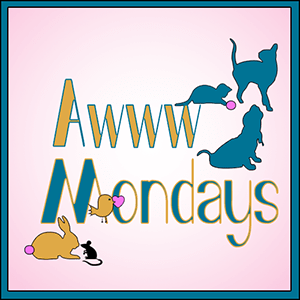 This entry was posted in Blog Hops, Fun and games and tagged Awww Mondays, Brody, cats in costumes, Comedy Plus, Halloween costumes, KaTwo, Milie, Mrs. Potato Head, Trouble by pilch92. Bookmark the permalink. I can tell that we’re not going to win this. I love Trouble today! Its like she is thinking “what on earth is *that* on my taileo’! Brody is wearing a tie that MJF had on in a lot of pictures…brought back some memories Its too buig for Dalton & Pipo, though with a few adjustments it will. KaTwo can cook? Maybe fish soup and nip muffins, tee-hee! Millie looks like a cute cowboy! We love your costumes but we are no smarter! Gosh this is a tougher one…….hmm….only one I’m sure about (sort of) is KaTwo with “Julie and Julia”……..then MAYBE Trouble in “Lockdown” ???? Welll, we are sorry to say that we don’t know any of them but interesting to see the answers from everyone.You all have a great day. Thank you 🙂 Trouble is perfect in her costume. Don’t tell Trouble, but when I saw that outfit I laughed out loud. Trouble and that outfit just go together. I still don’t know any of the movies. Your cats look very cute! My three would never put up with getting dressed up. I’m completely in awww(e) of how you got the costumes on those adorable kitties! You have so many great costumes for the kitties – yesterday’s were great too. Awww you are all so adorable! I think at least the first one is toy story! But that’s as far as i know! Oh my goodness, everyone looks cute in their costumes. I partial to the red tie! I think i recognize Toy Story and either Ratatouille or Julie and Julia (i have no idea about what years things come out). That’s all i have, and i may be wrong on those. Just ignore me, i’m rambling and having fun playing along. Those sure made me smile! We’re clueless but we love the photos!! Cuteness overload! This is such a sweet post. i love Troubles outfit!! great post filled with cutness! We’ve got nothing, but we love the costumes! Your cats are such good sports! Trouble, we have no idea what movie this is, but we do know that you are the purrfect kitteh to represent that one. PS: Brody, you look so sweet keeping watch on her antics. Trouble has me laughing with his jailhouse gear! Oh I love these costumes! Cute kitties dressed in their Halloween costumes ~ hope they get lots of great treats! We’re not sure what the contest is but we do know the costumes are cute! TW doesn’t know from movies. Sorry. I might like a movie with Mr. Potato Head though. We’re a little stumped. Obviously we don’t watch enough movies! I think Millie is Toy Story. No idea about Brody. Ka Two could be Ratatouille? And maybe Trouble is The Fugitive. I only know for certain that Millie and Mrs. Potato Head are going for Toy Story. Even though I’m terrible at guessing movies, you are all adorable beyond words! Yes, you are right 🙂 Thank you. Glad you enjoyed them. Oh gosh, this is a tough round of costumes. All cute, though!